Ann I Am! : Have You Heard of Zentangle? Really Cool Stuff! Have You Heard of Zentangle? Really Cool Stuff! My friend gave my girls a very interesting book for Christmas, Joy of Zentangle: Drawing Your Way to Increased Creativity, Focus, and Well-Being. I had never heard of Zentangle, but the book looked very intriguing. It is not really a children's book, but can be used with children. 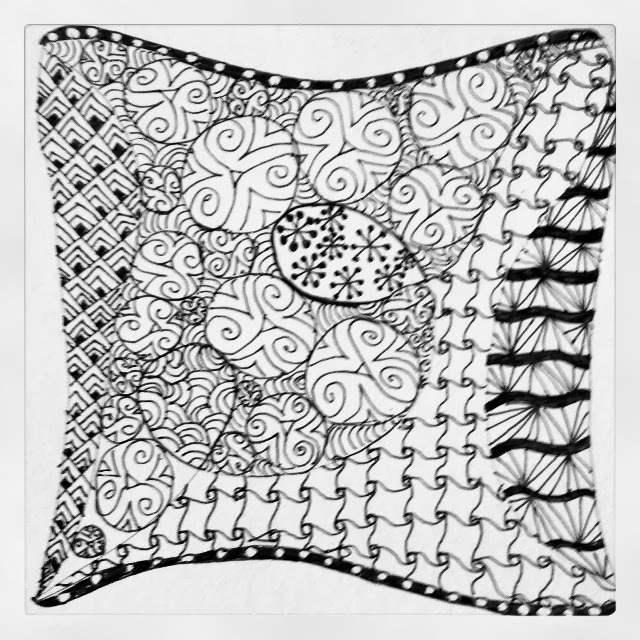 Zentangle is an easy-to-learn technique of drawing patterns that reduces stress. It also encourages creativity. The book explains to readers the theory of Zentangle and gives directions for drawing over 100 tangle patterns. When you draw Zentangles, it really seems like a part of your brain shuts down which promotes relaxation. We love Zentangles. And trust me, anyone can do it when you follow basic step-by-step instructions. This picture is my very first Zentangle. If someone told me I could do this before reading this book, I never would have believed it! Trust me, it is easy! Amazon sells this book in both paperback and Kindle formats. It would make a great gift for anyone. I especially think it would be nice for someone who is suffering from an illness as it promotes well-being.